Welcome to my guide on how to get waves on the side. After reading this you will have a good understanding of how to brush the sides, how long it will take to get waves on the side, and a few methods to get them in faster. Okay! To be completely honest with you, getting 360 waves on the sides of your head is not easy. It requires a lot of concentrated effort. If you don’t have waves at the top yet, you can still keep reading to gather the information however, you should know that its best to not stress over the sides until after the top waves have come in. If you’ve read how to get waves on the top , then you know why. To get waves on the side of your head you’re going to have to understand that waves are essentially laid down curls. The hair on the sides of African people’s head tends to be thinner than all other sides. I’m not sure why that is, but it’s just an observation I have made from helping so many people who struggled to get waves on the side. The hair on the sides tends to be thinner when compared to the top and back and this is what makes it take so long to wave up in comparison to the other sides. I’ve noticed from my own hair that after low haircuts my waves on the side occasionally loose definition and depth. This observation can be seen visually in when most black men with coarse, or near coarse hair like me cut their hair down low. This observation has allowed me to develop the following routine that is perfect for getting 360 waves on the sides. The process to get waves on the side faster is simple. You need to increase your brushing time and wolf longer! It will take you about a year to get waves on the side if you’re not getting enough brush time. That being said you need to make sure you’re on top of your daily brushing with multiple full length brushing sessions. The key to getting the sides to come in seamlessly is through increased brushing sessions coupled with longer than normal wolfing sessions. If you also begin proper hair conditioning along with cutting at the right length for your hair texture you will see fast progress. 1. Since the hair on the sides tends to be thinner you will want to avoid low cuts. Low cuts will reduce progress because low cuts chop off untrained hair. When you get your hair cut low, your hair becomes less curly and as a result any waves that aren’t fully trained get cut off with all of the extra curl you got from having longer hair. 2. You want to wolf longer because that gives you more time to train your hair on the sides to stay wavy. It may seem like it gets out of control when you’re wolfing, but if you keep it du-ragged and or do the Fast Accelerated Wolfing Method then you will be able to keep your hair in check while wolfing. The reason I say don’t stress over the sides before you get the top is because waves on top are generally easiest to get and maintain. I’m going to assume you already have waves on the top and that is why you’re reading this. Okay! I want you to do this experiment right now… Pick up your brush and then brush all around your head… Stop reading for one second and brush around your head real quick before you keep on reading. Now that you have finished brushing all around I want you to think back and remember what part of your head you started brushing first and which sides you spent the most time brushing. Even if you didn’t do the experiment just think about the part of your head that you brush first when ever you pick up your brush. Chances are if you’re like most people when ever you pick up your brush you by habit automatically brush the top first. This is just what most people tend to do. If you want waves on the side faster you should then consciously switch from brushing the top of your head first to brushing the sides first. The side of your head that you brush first tends to get the most brushing time so it makes sense that the top will come in first since that is the side you always brush first. To get waves in faster on the sides, I want you to purposely change the habit of brushing the top first and from now on always brush the sides first when ever you pick up your brush. This will not hurt you if you already have waves at the top because brushing them second or last will be enough to keep and maintain them. This method off brushing the sides first will allow you to effectively get them much more brush time so that they can come in faster. It took me nearly seven months to get my waves in on the sides. Don’t let that scare you though, because it’s not like I was only working on the sides. I was also working on the top and the back. The top came in within two months, the back within another two months, and the sides came in about three months after that. That still sounds like it took forever, bit listen I only count when they were in nice. In between the months I did see progress on the side and back that kept me motivated. The time it will take you to get waves on the side will vary from other people. I can tell you that the time it will take varies directly with the amount of brushing you do. The other factors that affect how long it will take are hair texture, and haircut frequency. Generally it will take people with coarse hair longer to get waves on the side because as I mentioned our hair generally runs thin on the side. Lastly getting your haircut less frequently will lead to faster progress as long as you”re coupling that with heavy every day brushing. 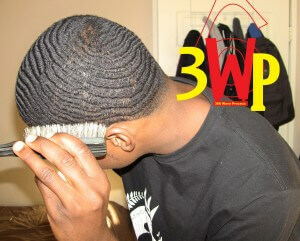 Check out our line of 360 wave brushes if you need a good brush to start your 360 wave journey! Thanks man this helped me out. I just can not get the waves on the sides; The wave greases I have are murays sportinwaves and 360style. And they only work on the top. You don’t need pomade, just use normal soft hair cream and water to lay down hair after bout towel method. Simple.